Mike Welles had everything under control. But that was before. Now things are rough at home, and they’re getting confusing at school. He’s losing his sense of direction, and he feels like he’s a mess. Then there’s a voice in his head. A friend, who’s trying to help him get control again. More than that—the voice can guide him to become faster and stronger than he was before, to rid his life of everything that’s holding him back. To figure out who he is again. If only Mike will listen. 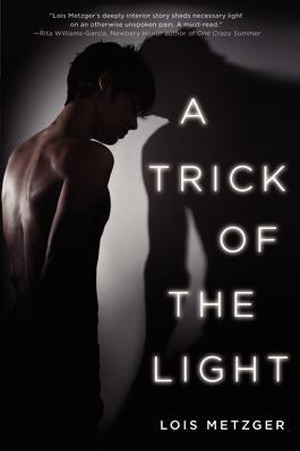 Telling a story of a rarely recognized segment of eating disorder sufferers—young men—A Trick of the Light by Lois Metzger is a book for fans of the complex characters and emotional truths in Laurie Halse Anderson’s Wintergirls and Jay Asher’s Thirteen Reasons Why. What a book! I was surprised by A Trick of the Light. I knew it was going to be about a young man with an eating disorder (did you know that there are over 1 million men in the US struggling with eating disorders? I learned that from this book), but I did not realize that the book was going to be told from the eating disorder's point of view. That really surprised me when I figured out who the narrator was. I naturally thought that Mike would be the narrator. A Trick of the Light was not an easy book to read. It is what I like to call emotionally heavy. It made me sad for much of time I was reading it, and I had to put it down to take breaks. Otherwise I was just too sucked into the story and stayed sad even when I wasn't reading. I loved that Metzger brings a little-known problem to light with her story. It was good to read about eating disorders from a male perspective. And I could tell both from the writing and from the notations at the end that Metzger really did her research while writing this book. I love that, it makes me feel like I'm reading for education as well as entertainment. 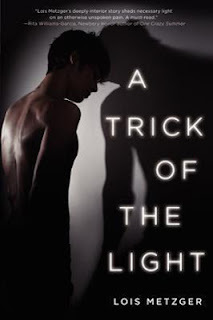 A Trick of the Light is one of those books that I think should be required reading for high school students. It seems like eating disorders in males are under-diagnosed as well as under-treated and I think it would help teens to read about a young man with this problem. I liked that Mike changes so much throughout the book. The ending was just perfect: it wrapped things up but left the exact details sort of open. I like that. It was also a very realistic ending, with appropriate conflict resolution. I liked Metzger's writing style and the way she handles this gripping subject. I thought this was a great book and would recommend it.